Gunmen in South Sudan have kidnapped at least 89 boys, some as young as 13, while they were preparing to sit school exams, according to the UN. Armed soldiers surrounded Wau Shilluk, a village near Malakal, and went house to house searching for boys and taking them away by force, according to witnesses. The total could be much higher than 89, according to a report from Unicef, the UN children’s agency, on Saturday. Six teachers were also abducted. It is not clear which armed group was responsible for the Wau Shilluk mass abduction a week ago. The village is a riverside community in government-held territory in the oil-rich Upper Nile state. The village has seen its population swell to about 90,000 due to a flood of internally displaced people, mostly from Malakal, a site of intense fighting that has changed hands several times. 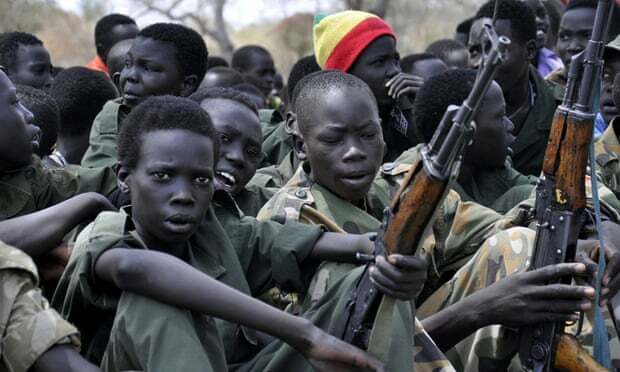 South Sudan has a long history of having child soldiers but recruitment has increased since fighting began in December 2013 when the president, Salva Kiir, accused his former deputy, Riek Machar, of planning a coup. The war rages on despite numerous ceasefire deals and with peace talks under way in the Ethiopian capital, Addis Ababa. Human Rights Watch named one of the culprits as Johnson Olony, a warlord aligned with the government who controls the area where the 89 boys were kidnapped. The community is mostly made up from members of the Shilluk tribe, the country’s third biggest ethnic group after Kiir’s Dinkas and Machar’s Nuers. While the war in South Sudan has often pitted Dinkas against Nuers, Shilluks have largely stayed neutral. South Sudan is the world’s newest state, having gained independence from Sudan in 2011. At least 10,000 people have been killed and 1.5 million internally displaced by the war. The UN estimates that 2.5 million people are in a state of emergency or crisis, just short of famine. Regional mediators have set a 5 March deadline for Kiir and Machar to reach a final peace agreement, but previous deadlines have been repeatedly ignored despite the threat of sanctions. The UN last month secured a pledge for the release of about 3,000 child soldiers in South Sudan, in what it called “one of the largest ever demobilisations of children”. Posted on 23rd February 2015 by newsafrica. This entry was posted in Africa, Machar, President Kiir, South Sudan. Bookmark the permalink.